“The Honorable Judge” Corporate Painting for its new lobby. 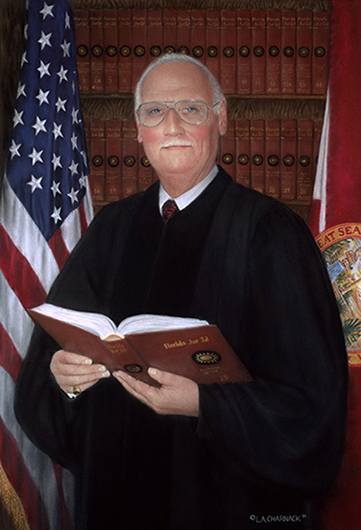 This portrait may look like The Honorable Judge was actually standing in a wonderful library with the flags framing the law books; however this background was completely pieced together. The Library section of Family Law was taken from the renowned law offices of Ruden, McCloskey, Smith, Schuster & Russell while the flags where from a visit to Nova Law School. The Judge was actually standing in his office with a window behind him for his sketch and the background was carefully created around him to complete this very impressive 30″X 40″ portrait. When working with dark colors of pastel one must be very careful apply the dark colors slowly as not to blend in with the light colors. The red tie and book gave color in the forground with the books and flags adding color and stature. If you are considering a Corporate Portrait I would be delighted if you contact me directly for a free consultation to talk about your thoughts.